Maine is the largest of the six New England states in area, it lies at the northeastern tip of the country. Its 33,265 square miles (86,156 square kilometres), including 2,270 square miles of inland water area, represent nearly one-half of the total area of New England. 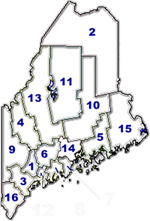 Maine is bounded on the northwest and northeast by the Canadian provinces of Quebec and New Brunswick, respectively, and on the west by New Hampshire. The famed rocky coastline of the state is angled from southwest to northeast along the Atlantic Ocean. Maine's capital has been Augusta since its admission on March 15, 1820, as the 23rd state of the Union. There are two theories of the derivation of the state's name: that the state was named for the former French province of Maine and that it was so named for being the "mainland," as opposed to the coastal islands. Maine is the most sparsely populated state east of the Mississippi River. Nearly 90 percent of its total land area is under forest cover. It is also, by most statistical measures, an economically depressed state, but the rugged beauty and challenge of its climate and landscape and the character of its people have given Maine an importance beyond its economic and political power. Limited economic growth, in fact, has contributed to the preservation of much of its natural appearance. Since 1970 the state's southwestern coastal counties have recorded accelerating growth rates, increased residential and commercial construction, and increased tax revenues. Maine's economy remains dependent on manufacturing related to the timber harvest (mostly paper and paper products). The extractive industries of fishing, mining, and agriculture have been surpassed by trade and the recreational and service industries, these latter accounting for an increasing percentage of the state's income. The state epitomizes the increasingly difficult national choices between preservation of environmental quality and potential economic expansion. Augusta is the capital (1831) of Maine, U.S., seat (1799) of Kennebec county, at the head of navigation on the Kennebec River, 57 miles (92 km) northeast of Portland. The city's establishment and early prosperity, which began with the arrival of traders from the Plymouth colony of Massachusetts in 1628, can be attributed to its location on navigable tidewater 39 miles (63 km) from the Atlantic Ocean. A trading post was established on a site the Canibas Indians called Koussinoc. The first permanent structure, Fort Western, was built there in 1754 for protection against Indian attacks. (In 1922 the wooden fort was restored as a historic monument and museum.) In 1797 the settlement was incorporated as the town of Harrington; the present name (for Pamela Augusta, daughter of the Revolutionary War general Henry Dearborn) was adopted later that year. State government operations, augmented by the University of Maine at Augusta (opened 1965), and light industry are the economic mainstays; manufactures include paper, steel, food products, and computer products. The State House (1829–32) was originally designed by Charles Bulfinch and has a 185-foot (56-metre) dome topped by a statue of Minerva created by W. Clark Noble. The Executive Mansion was the former home of James G. Blaine, unsuccessful presidential candidate in 1884. The state's history and natural environment are depicted in exhibits at the Maine State Museum. With the Belgrade chain of lakes 15 miles (24 km) north and the Kennebec River reaching south to the sea, Augusta is one of the state's leading vacation centres. Inc. town, 1797; city, 1849. Pop. (1990) 21,325; (1996 est.) 20,441. Maine has three relatively well-defined climatic areas: southern interior, coastal, and northern. The southern and coastal regions are influenced by air masses from the south and west. North of the land dividing the St. John and Penobscot river basins, air masses moving down the St. Lawrence River basin tend to prevail. Mean annual temperatures range from 37° to 39° F (3° to 4° C) in the north and from 43° to 45° F (6° to 7° C) in the southern interior and coastal regions. Mean temperatures are about 62° F (17° C) throughout the state during the summer and 20° F (-7° C) during the winter. Clear days range from about 100 per year in the south to only 70 in the north, and annual precipitation averages 36 to 48 inches (910 to 1,220 millimetres). Snowfall averages more than 100 inches in the north and at higher elevations.